Lisse is located in a region that has traditionally been known for agriculture. The village gained fame when it was discovered that the grounds were very suitable for the cultivation of flowers, from which originates its nickname "the flower village". This region still is the eminent area for flowerbulbs in the Netherlands. A lot of these bulbs are exported all over the globe. 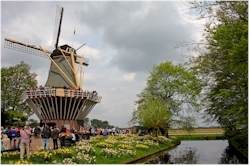 The most wellknown sight of Lisse is obviously related to flowers: the world-famous Keukenhof. The flowerpark. 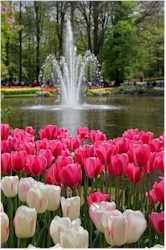 The Keukenhof is an extensive park principally laid out around tulips but other flowers such as daffodils, hyacinths, lilies and crocuses also receive a lot of attention. The originally 19th century English landscape garden is used as base for the annual reconstruction of the flower beds. Each year a new design is laid out around a different theme and this has been the tradition since 1949 when for the first time an open air flower exhibition was organized in the garden of the castle. A lot has changed since those early days: the Keukenhof has grown and attracts now hundreds of thousands visitors from all around the world. The colorful flower beds are planted by gardeners of the Keukenhof but with bulbs that are provide by a group of selected cultivators. These growers have to go through a severe selection process before they are allowed to supply bulbs to the park. Being allowed to supply the park is one of the best promotions that exist for cultivators. At several spots in the park there are pavilions that carry a name which refers to the Dutch Royal family: Wilhelmina, Juliana, Beatrix, Willem-Alexander and Oranje-Nassau. Flower shows and exhibitions are organized in these pavilions. Others sights are the castle and the windmill, which was relocated here and has a mere decorative purpose. The small ones have not been forgotten either: for the kids there is a playground and an animal farm on the premises. 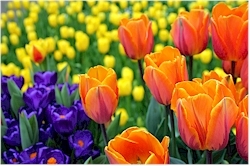 Although flowers and more particularly tulips are one of those iconic symbols of the Netherlands, they did not originate here. 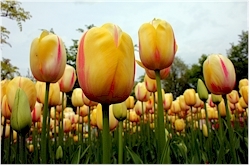 Tulips were imported for the first time in Western Europe from the Middle East in the 16th century. However, they soon became an important export product for what are now the Netherlands. 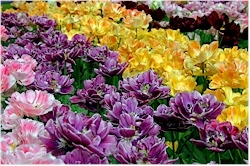 Up till today, the country is still one of the most important producers and exporters of flower bulbs worldwide. Take into account that the park is only open during the flowering period and that's only a few weeks in spring (see the website keukenhof.nl for the exact opening days and hours). It's also possible to buy bulbs in the park or just outside it. 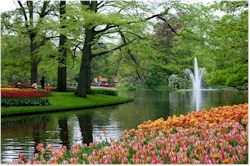 How to get to the Keukenhof? It's fairly easy to get there by car. However, you have to take into account that you will not be the only visitor and that you will have to queue to get in. For the occasion a temporary parking lot has been created just outside the main entrance. If you wish to use public transport, then you can take a bus from Amsterdam or Leiden that stops at the entrance of the park. » How to reach Keukenhof?